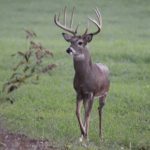 John’s Note: Bob Walker of Livingston, Alabama, has guided for deer and turkeys for almost 3 decades at Bent Creek Lodge in Jachin, Ala. He’s been deer hunting for more than 40 years and is on several outdoor pro staffs. 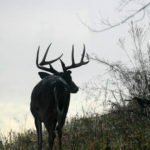 This week he’ll tell us how to find big bucks where no one is looking for them. A friend and I decided to go to Kentucky and hunt a public-hunting area that was for bowhunting only. We got a map of this land and went to check the property out the day before bow season arrived. While we were driving around searching for the boundary lines, we saw this area had cornfields on both sides of it, with a small strip of hardwoods next to the road. I got my friend to take me back to the property line that divided the public-hunting area from the cornfield. I walked the property line, which was wooded, to try to find a place to hunt. I discovered this cornfield wasn’t as big as I thought it was – only about 8 acres. But I spotted a small finger of woods that was marked off as public-hunting land that ran out into the cornfield for about 100 to 150 yards. I scouted that little finger of woods and saw a tremendous amount of deer sign. I walked about 20 yards from the end of that little woodlot, looking for marks on trees where other hunters had put up tree stands and left candy wrappers, soft drink cans and/or cigarette butts on the ground or anything that would indicate that someone had hunted the small finger of woods that ran out in the middle of the cornfield. I couldn’t find any hunter sign. I also saw there were two trees that had fallen from the edge of the corn field into the center of this little woodlot, creating a small funnel area that deer would have to walk through, to move through this little woodlot. That’s where I decided to put my tree stand. I got into my tree the next morning before daylight, let the woods settle and heard deer moving through the corn. Just as I had enough light to see, I spotted does, a spike and a 6-point bedded about 20 yards from my tree stand. Too, other deer were walking through this little finger of woods. I heard a deer get up out in the corn and start coming toward my stand. 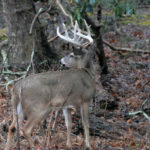 When I could see him, he was a 138-inch 9-point buck. Once the buck came out of the corn, he walked straight to me. I had the wind in my face, so I knew he couldn’t smell me. The buck then turned to the right, and I placed the arrow behind his shoulder. 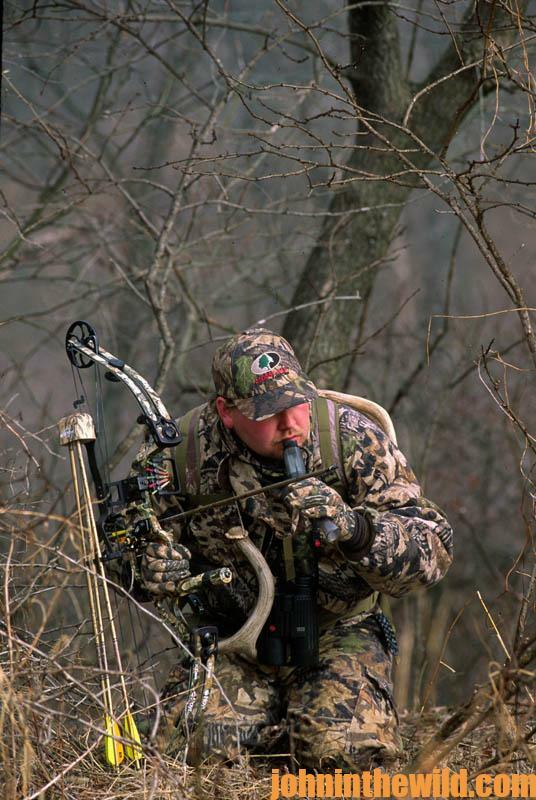 The broadhead went through the kill zone and buried up in his off-shoulder. I heard him crash, and I followed the blood trail for about 65 yards. 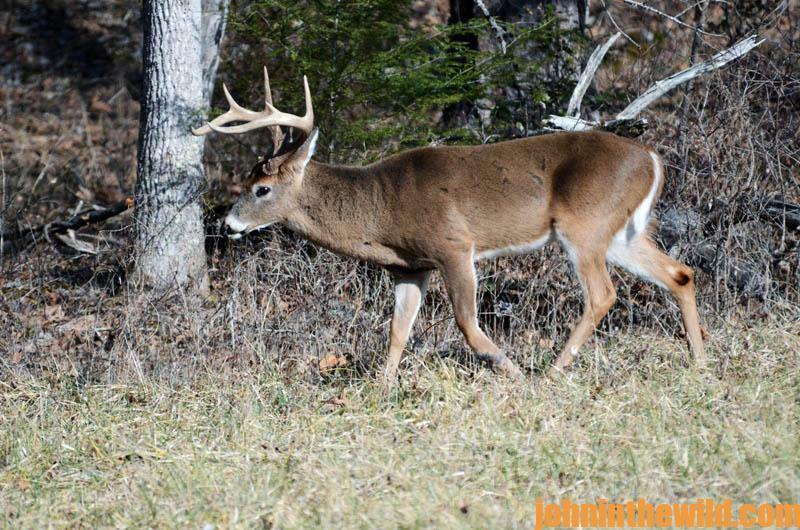 From this hunt, I relearned the value of walking the property lines on public-hunting areas. 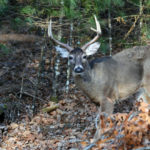 I also realized that most hunters wouldn’t want to hunt close to a WMA’s property line, thinking that the most and biggest deer were ganged up in the middle of a public-hunting place. But I’ve discovered when you can locate one of those irregular property lines – like this little finger of woods that went out into the cornfield – often, you can take bucks other hunters never will see. 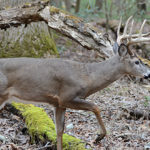 These mature bucks have learned they can’t survive where hunters hunt, but they can survive in little woodlots or thick-cover areas where hunters don’t hunt. 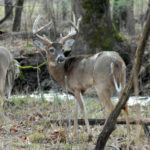 To get John E. Phillips’ eBooks and print books on hunting deer, including his newest deer-hunting book, “Whitetail Deer and the Hunters Who Take Big Bucks,” available at http://amzn.to/2bYwYOK/, and you can click on these books to learn more, “How to Hunt and Take Big Buck Deer on Small Properties,” “How to Hunt Deer Up Close: With Bows, Rifles, Muzzleloaders and Crossbows,” “PhD Whitetails: How to Hunt and Take the Smartest Deer on Any Property,” “How to Take Monster Bucks,” “How to Hunt Deer Like a Pro,” and “Bowhunting Deer: Mossy Oak Pros Know Bucks and Bows,” or to prepare venison, “Deer & Fixings.” Or, go to www.amazon.com/kindle-ebooks, type in the name of the book, and download it to your Kindle, and/or download a Kindle app for your iPad, SmartPhone or computer. You also can find John’s books on Nook at www.barnesandnoble.com.